Ninja Registration Nº: 56-001 Birth Date: 19 January Age: 12-13 (I), 15-16 (II) Horoscope: Capricorn Gender: Male Blood type: AB Height: 146 cm (Part I), 166 cm (Part II) Weight: 39 kg (Part I), 50.9 kg (Part II) Affiliation: Hidden Sand Village, Wind country Occupation: Kazekage, Regimental Commander of the Allied Shinobi Forces, Commander of the Fourth Division Team: Team Baki (Temari, Kankuro and Gaara ) Tailed Beast: One-Tailed Shukaku Known relatives: Fourth Kazekage (father), Karura (mother), Temari (older sister), Kankuro (older brother), Yashamaru (uncle) Gaara was introduced in the series in Chuunin Exams arc, as a violent shinobi from Konoha's allied country, the Wind country. He came to Konoha with his siblings Temari and Kankuro, and with his mentor Baki, to participate in Chuunin exams. From the first look, he was shown as merciless and violent individual. 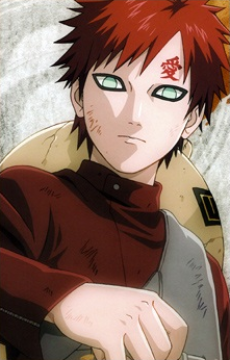 Due to his hard childhood, and lack of love, Gaara grew up hating everybody around him, loving only himself. In fateful incident about 6 years before the main story time, he made himself a tattoo of Japanese Kanji letter "Ai", which stands for "Love". In Gaara's case, that Love was for himself, as he was "Demon loving only himself". Gaara's point of view dramatically changed after a clash with Naruto, who taught him the true meaning of loving others. Since then, Gaara always feels in debt to Naruto, and tries to help him as much as he can. Like Naruto, Gaara is a Jinchuuriki who holds within him the one tailed beast, Ichibi no Shukaku. Gaara also relates to Naruto in that in his early years, Gaara was often repelled by other children, and feared by Suna's citizens due to the incredible power he possessed.